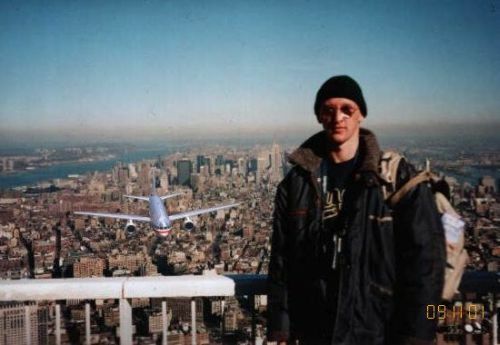 The tourist guy, is an Internet phenomenon consisting of a photograph of a tourist Photoshopped pictures after the September 11, 2001 attacks. The tourist was identified as PÃcter Guzli. Soon after 9/11 an image showing a tourist while an airliner was about to hit the building beneath him circulated on the Internet. It was claimed that the picture came from a camera found in the debris at Ground Zero. The picture won a best 9/11 Photoshopped picture contest.